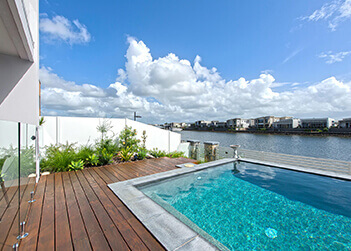 Our modular fencing systems are specially designed to endure Australia’s unique weather conditions, making them an excellent choice for the Gold Coast climate. With certain wall styles rated for up to Wind Region C, and aluminium post options for coastal rust-resistance, there is no boundary wall or fencing system quite like ours that truly delivers on quality and simplicity. Our fences offer premium aesthetics that mimic the look of rendered brick, for only half the cost and a quarter of the install time. Our systems can easily be installed DIY, or you can request for our nationwide network of Trade Partners to expertly handle the whole process from quoting, to ordering, to installing. You can even finish your wall off in original style by choosing to integrate retaining panels or lighting, letterboxes, slats and infills. Australia’s urban sprawl is pushing residential zones closer to major roads or commercial/industrial areas, therefore triggering a large percentage of the population to need acoustic protection. Delivering an average 20dB – 25dB noise reduction, our fencing and wall systems will help block out unwanted traffic and neighbourhood noise, whilst also providing more home privacy. 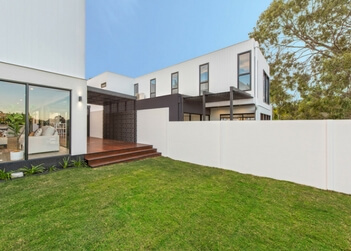 ModularWalls products can be supplied as a DIY kit or professionally installed by one of our qualified Trade Partners, from Currumbin all the way up to Hope Island. Our Head Office is open 8.00am to 4.30pm (Sydney time), where our friendly staff are always eager to discuss your project and advise on any aspect from materials, to wall designs, to DIY installation support. Give us a ring on 1300 556 957 or enquire online to discuss how we can best support your project, no matter where you reside. We supply materials to the furthest reaches of Queensland, and our systems can easily be installed DIY or by any local fencer, landscaper or builder. Give our team a ring on 1300 556 957 or enquire online to discuss how we can best provide the perfect solution for your project, no matter where you call home. For one couple, Hope Island is the perfect setting for their dream retirement lifestyle and brand new home. For this coastal home in Palm Beach, QLD, SlimWall’s expressed joint feature perfectly harmonised their weatherboard cladding. 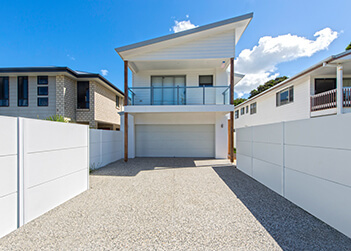 SlimWall modular fencing provided the perfect, premium dividing fence for this brand new duplex situated along the Gold Coast. Get started on your Gold Coast project today! Our wall systems are specifically designed to withstand Australia’s harsh conditions, and are an ideal choice for the Gold Coast climate. With certain wall styles rated for up to Wind Region C, and the option to use aluminium posts for better rust-resistance in coastal areas, the Gold Coast client has been thoroughly considered in the very structure of our products. From impact resistant road noise barriers, to wall and fencing solutions for community developments, to revolutionary sound absorbing panels, our noise attenuation products aid in combating today’s modern noise pollution issues. Our commercial retaining panels also seamlessly integrate into our boundary or noise barrier systems, delivering a highly simplified wall solution for sloping blocks. With the option to integrate designer features such as lighting, letterboxes, slats, infills and more, never before has one fence delivered such a high level of versatility. When compared to traditional concrete, our products provide exceptional aesthetics and deliver up to 80% reduction in embodied and emitted carbon project-wide, to help with today’s carbon efficient construction methods. Their modular arrangment promises a swift and easy installation, whilst the lightweight materials overcome any site specific difficulties, such as easements across public services or restricted access sites. We are here to support your project at every step; from initial design drawings, all the way through to the final install, we can provide a customisable and quick service. Our products are all Australian Made at our Head Office & Manufacturing Plant in Kurnell, NSW, ensuring rapid manufacture and a firm control of the whole supply chain, as well as the ability to tailor the design to your specified project needs. 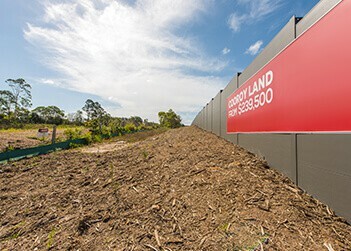 From Currumbin to Hope Island, we have become the trusted market leader of acoustic barriers, boundary walls and fencing solutions. Our QLD consultant, Troy Waddell, is always happy to discuss your specific project needs. Give us a call on 1300 556 957 or enquire online to discuss how we can provide the best solution for your next commercial project. ModularWalls has completed works in some of Australia’s most remote locations and harshest climates; give us a call on 1300 556 957 or enquire online to discuss how we can provide the best solution for your project. 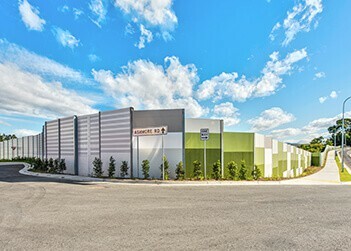 The Coles Benowa Village Shopping Centre completed the major Gold Coast infrastructure changes and created a new urban heart in need of a noise attenuation solution. 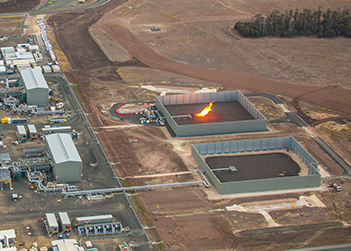 The brief was to design and construct 15 flare enclosures for APLNG Upstream, a multi-million-dollar gas extraction project for principle Origin Energy. The proximity of a major road from this master-planned community necessitated the erection of a highly effective civil noise wall; EnduroMax fit the bill perfectly.